ROME (AP) — After a rough stretch, things are finally starting to look up again for Roma’s American president. James Pallotta’s joy of reaching the Champions League semifinals last season quickly turned to despair when nine people were arrested in June for alleged corruption involving the club’s long-delayed plans to build a new stadium. The U.S. ownership was seen as too business-like after selling off the backbone of the squad — goalkeeper Alisson to Liverpool, midfielder Radja Nainggolan to rival Inter Milan, and beloved defensive midfielder Kevin Strootman to Marseille. However, helped by a pair of goals from 19-year-old Nicolo Zaniolo in the first leg, Roma takes a 2-1 lead into next week’s Champions League match at Porto. And perhaps it’s only coincidence, but Roma has gone undefeated in its last eight Serie A matches stretching back to December — the same period when fans put up the “Go home” banners. What really bothers Pallotta are the ongoing delays and complications over the new stadium project. Pallotta first presented the stadium plan nearly five years ago, saying it would be ready for the 2016-17 season. Construction has still not started. The massive project — due to include a training center, entertainment complex, office space and extensive transportation works — has been delayed by environmental concerns, bureaucracy and criticism over public funding. The project’s cost was originally valued at 1.6 billion euros ($1.8 billion), including more than 200 million euros in public financing, but has since been downsized. 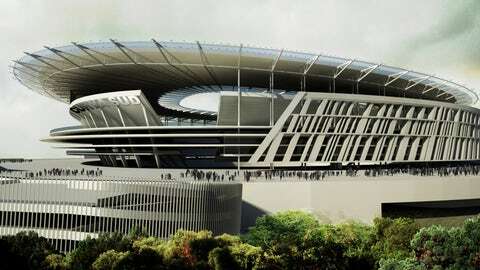 With the stadium’s main constructor, Luca Parnasi, among those arrested in June, Pallotta has had to take more matters into his own hands and is currently negotiating a 105 million euro deal to buy the proposed stadium site in Tor di Valle, which is about halfway between downtown and Leonardo Da Vinci Airport. For now, Roma still plays in the Stadio Olimpico, which is run by the Italian Olympic Committee, and which it shares with city rival Lazio. On Saturday, the Olimpico will host the always-heated Rome derby between Roma and Lazio. Like many stadiums in Serie A, the Olimpico has poor sightlines due to a running track around the field and is generally outdated with a lack of commercial features. Pallotta is a member of a group of Boston executives who purchased Roma in 2011 to make it the first foreign-majority owned team in Serie A. He’s also a minority owner of the Boston Celtics. When Pallotta became Roma’s president in 2012, he declared that the Giallorossi could become one of the top 10 clubs in world soccer — which still seems like a far-fetched goal with Roma currently sitting fifth in the Italian league. Pallotta has periodically issued ultimatums over the stadium, saying he would leave the club if it is not built. But he now says he has “never” contemplated walking away.